Growing up, we always had raspberries, blueberries and rhubarb in our garden. 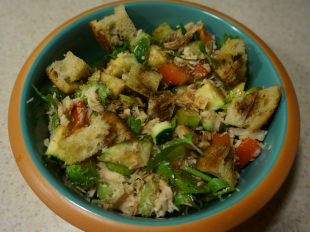 One of my mother’s favorite foods is rhubarb and she’d pick the rhubarb all summer long. Our basement freezer was always full of frozen rhubarb! My mother always wanted to have some readily available to bake rhubarb pies or make oatmeal rhubarb crunch. Since oats are higher in nickel, I love combining the sweetness of strawberry with my rhubarb. 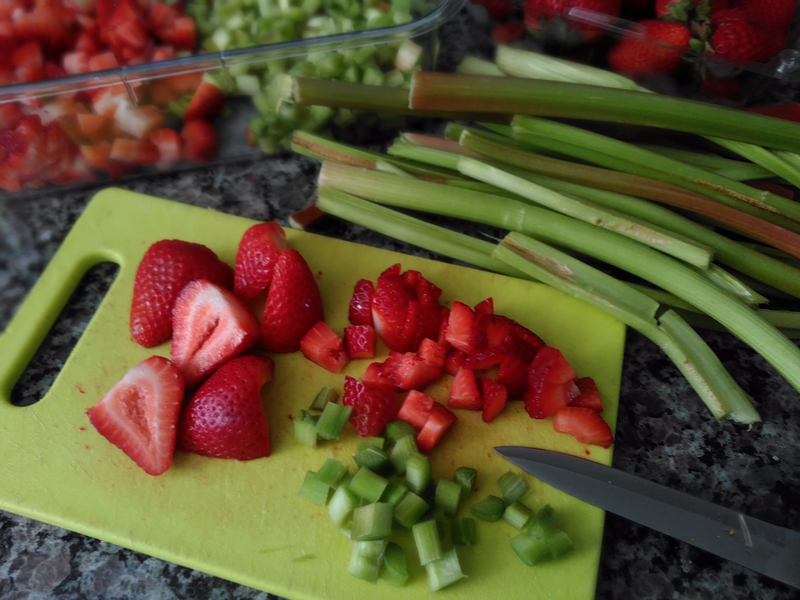 Dicing and prepping the fresh strawberries and rhubarb for my low nickel strawberry rhubarb pie! Technically a vegetable, rhubarb is lower in nickel and high in vitamin K. Those of us on the low nickel diet can become deficit in vitamin K, as leafy greens are some of the easiest foods to eat that high in vitamin K. Symptoms of vitamin K deficiency can include heavy bruising and excessive bleeding as vitamin K is a natural coagulation as it helps your blood clot as well as it helps your bones absorb calcium. Other foods lower in nickel that are higher in vitamin K include broccoli, kiwi and blueberries. Though I understand it’s difficult to get all the required vitamins and minerals from what we eat, I am cautious about taking supplements, especially without the consultation of a physician. 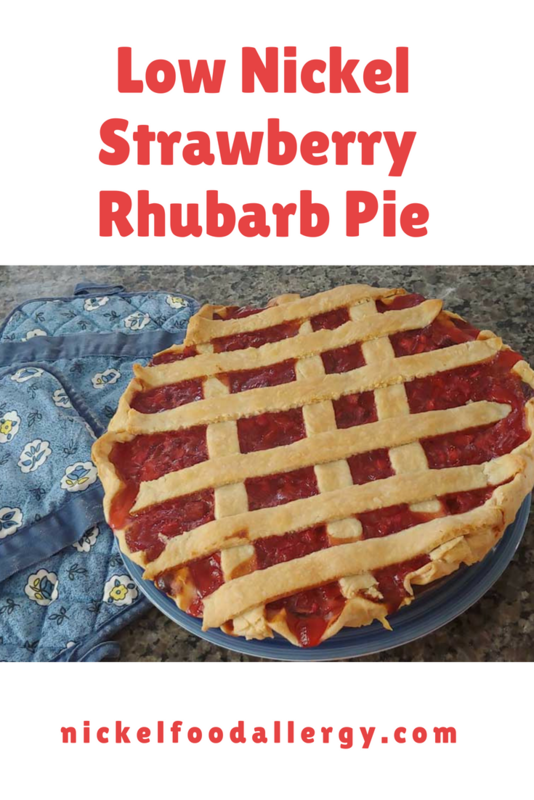 If you use fresh strawberries and fresh rhubarb, it usually takes me 30 minutes total to dice both my strawberries and rhubarb. Often I’ll bake this pie on the weekend and dice the fresh ingredients in advance and freeze them for later. I prepare the unbaked pie crust and lattice before boiling the pie filling on the stove. 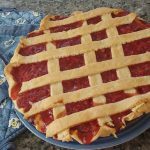 The perfect combination of savory and sweet, this low nickel strawberry rhubarb pie recipe will be talked about at any event or family occasion. Place the flour in a large bowl. 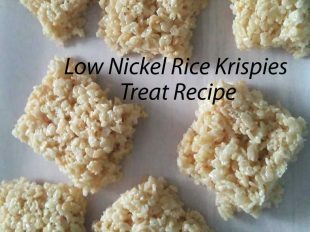 Melt the butter in the microwave for 20-30 seconds and pour it over the flour. Using two kitchen knives, "cut up" the flour and butter until it is clumpy and then add the cold water. Start kneading the flour with your hands and shape it into a large round ball. Sprinkle a little more flour if needed. Lightly dust some flour onto the counter and the rolling pin. 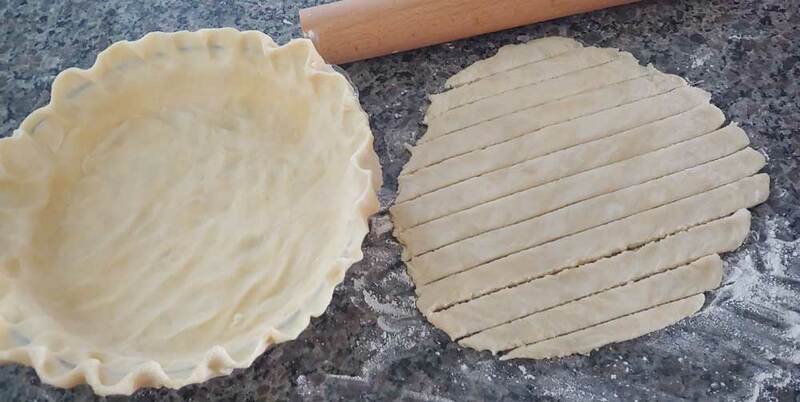 Roll the pie dough several times into a thin layer of dough that is large enough to cover your glass pie dish. Pinch the edges of the pie dough along the outside of the pie dish. If you're creating the lattice, roll out the dough into a thin layer of dough and use the back of one of the kitchen knives to slowly cut the lattice strips or cut out shapes using cookie cutters. Dice the strawberries and rhubarb and set them aside. Combine all the pie filling ingredients in a large ceramic sauce pan. Place the saucepan on medium heat, stirring regularly for 10-15 minutes or until it starts to boil and thicken. Next slowly pour the hot thickened pie filling into your unbaked pie crust and place the individual lattices or uncooked dough shapes on top of the filling. Bake the low nickel strawberry rhubarb pie on a cookie sheet for 40-45 minutes or until it bubbles and and the crust looks golden brown. Wait the pie to cool fully before eating! 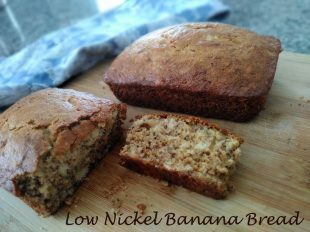 Enjoy a slice by itself or with a little homemade whipping cream! Typically first I'll dice the strawberries and rhubarb and place them aside. Then I'll make the homemade pie crust and lattice, so they're ready when your pie filling begins to boil. I like full pies, so I bake them on a cookie sheet to retain heat for the bottom of the pie and to retain any pie filling that may fall out of the pie! You can use fresh or frozen strawberries and rhubarb, that have been thawed and drained if there's excess water. Thanks for your comment and appreciation for my blog! You’ll have to keep me updated if you tried my recipes and if they helped your girlfriend by not causing her eczema to react!